In honor of Dr. Natalie Drake’s participation in the Flatwater Foundation’s ‘Dam That Cancer’ paddle board event, alongside her upcoming lecture, “Sexual Dysfunction in Female Cancer Patients” at Canopy, the Cancer Survivor Center in The Woodlands, Practice Happiness is focusing on giving back to the cancer community this June. *Please be prepared to bring proof of medical record of cancer to your appointment. ANNOUNCING: Practice Happiness and Dr. Natalie Drake are thrilled to announce that we will now be exclusively performing the ThermiVa procedure at Rivela Plastic Surgery, located in The Woodlands, Texas. Visit our location page for directions or call at (281) 402-3268 to book your appointment! Dr. Natalie Drake is passionate about working with female cancer patients surrounding the issue of treatment-caused sexual dysfunction. 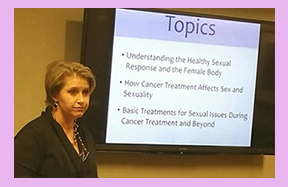 In this image, Natalie Drake discusses this topic with women at the Memorial Hermann The Woodlands Hospital’s Oncology Education Series. She will be discussing this same topic at other events in the future! Stay tuned for dates, times, and locations.